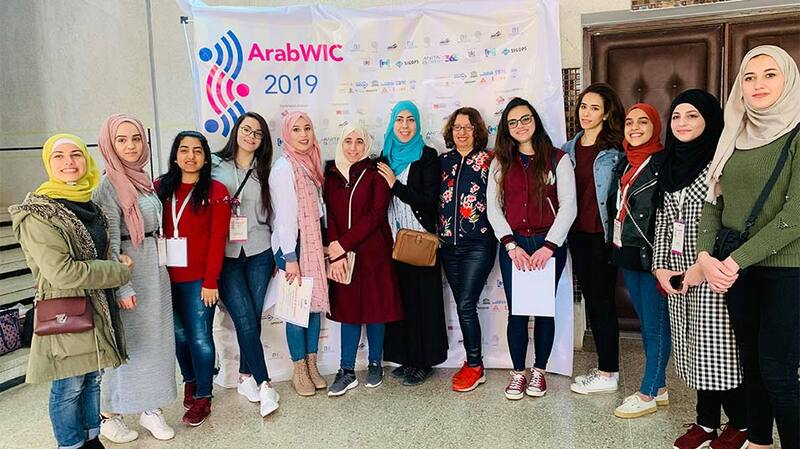 Bachelor and master’s students from the Faculty of Engineering and Technology at Birzeit University participated in the 6th Annual International Conference for Arab Women in Computing (ArabWIC), held between March 7 and 9, 2019 in Rabat, Morocco. The students, who are studying towards bachelor’s degrees in computer science and master’s degrees in software engineering, presented projects and took part in workshops that explored the state of the art in computing and technology, the current status of research and development, the latest innovations and trends, entrepreneurship, and the role of women in tech start-ups. With the participation of more than 600 academics and entrepreneurs, the conference aims to support and celebrate women in computing in the Arab world and to create links with the global tech ecosystem. ArabWIC members have so far organized five annual conferences (2012, 2013 and 2015 in Abu Dhabi, 2016 in Algeria, and 2017 in Lebanon), featuring renowned technical researchers, keynote talks, interactive technical workshops, hackathons and other activities.